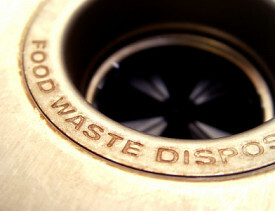 Garbage disposals (or more properly, food disposers) are wonderfully simple appliances that almost never break down. If yours stops spinning and either doesn’t work at all or makes a worrisome humming noise, you're probably just dealing with a jammed garbage disposal. Something really hard may have gotten stuck between the impellers—the swiveling metal “teeth” that chew up the food scraps—and the side wall of the grinding chamber or, more likely, between the wall and the plate beneath the impellers. This is where little things like fruit pits, gravel and staples lodge, providing more resistance than the disposer motor can handle. When a jam occurs, the disposer may shut down via an internal “breaker” switch, or the motor will keep running to no avail, causing that humming noise, which isn't good for the motor. Alleviating most jams takes just a few minutes. The first step—always—is to make sure the disposer’s power switch is off. As an extra precaution, you can turn off the circuit that serves the disposer at your home’s electrical service panel (breaker box), and that’s up to your discretion. Next, look inside the disposer with a flashlight to see if you can spot the source of the jam. Inspect carefully around the impellers and the impeller plate, particularly the small gap between the plate and the side wall of the chamber. If you see something, try to extract it with needle nose pliers, chopsticks, or other finger-like tool. You can also use your hands, but again, that’s a safety-risk call you have to make. If you got something out, try running the disposer again, with the cold water going (you should always run the water while using the disposer). Can’t find any obstruction? Skip ahead to Moving the Motor Manually. If your disposer has already tripped itself (no motor humming), look for the reset button on the bottom or the side of the unit underneath the sink. It’s small, so you have to look carefully. Press the reset button and try the disposer again. At this point, if you hear humming once more or you hear the motor start to engage then quickly shut down, you still have a jam. If you hear nothing, try the reset button a couple more times, but chances are you need a new disposer (see tips, below). Most modern disposers have a manual crank—simply an exposed Allen-nut head located in the bottom center of the disposer unit. Turn the head with an Allen wrench to move the motor (and impeller plate) manually. Look on the side of the unit or in the general area of the disposer for an Allen tool for this very purpose. Manufacturers often provide a little plastic bag for holding the tool, and any conscientious plumber will have stored it in a sensible location for you. If you don’t have a tool, find an Allen wrench (it’s hexagonal, or 6-sided) that fits the disposer’s crank head. Turn the manual crank back and forth, several times if necessary. You can move the motor manually in both directions, but because the automatic function moves only in one direction, going backward often dislodges (or breaks up) the obstruction. If the crank spins easily, the jam is freed, and the obstruction has either gone down the drain or it’s moved back into the grinding chamber, in which case you should fish it out. If your disposer has no manual crank, you can move the impeller plate manually by sticking a broom handle or strong stick (such as a 1 x 2 or 2 x 2) down into the disposer and levering it against an impeller and the drain hole in the sink. If a levering action isn’t possible, just try a simple push/pull action, as if you’re stirring a vat of hard dough. Go back and forth as needed to dislodge the obstruction. Unlike most appliances today, food disposers are reasonably priced and actually durable goods. They’re also pretty easy to replace. A standard, 1/2-horsepower model is the best buy for most kitchens. Follow the manufacturer’s installation instructions to replace. Be sure to seal the sink sleeve (the top-most piece in the assembly that sits on top of the sink hole) carefully with an even bead of plumber’s putty to prevent leaks. If you'd prefer not to DIY, find a reliable contractor to deal with your jammed garbage disposal.